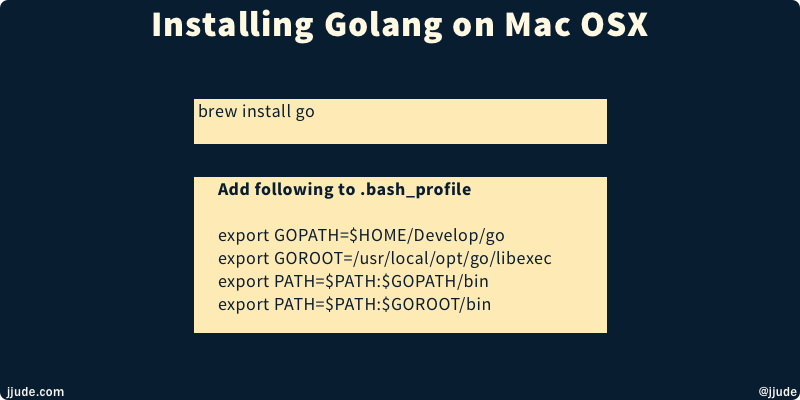 The easiest way to install Golang on MacOSX is by using brew. You can verify the installation by issuing go version. As of this writing, the latest version is 1.9. Go is an opinionated language. If you want to learn Go, you have to follow its conventions. By convention, all Go code lives within a single workspace (folder). This workspace could be anywhere in your machine. If you don’t specify, Go will assume $HOME/go as the default workspace. Place this workspace in your machine anywhere you like. For me it lives under $HOME/Develop/go. We also need to setup a GOROOT variable for Go to work properly. We will setup all of these in bash_profile. If you use other shell (like zsh), you will have to modify the respective config file. Open bash_profile in your favorite editor—vim , code, cot, or plain text editor. Add these at the end of the file. Ensure you change GOPATH to correct directory. Save and exit. Make it valid for the current terminal session by issuing, source ~/.bash_profile. Go places its files in three directories: All source code lives in src, package objects lives in pkg, and the compiled programs live in bin. Let us create them. Run the program with go run hello.go. It should output Hello World!. Congrats. You are now ready to become a master in Go language.